While driving on a highway, keeping your car or SUV in the middle of the lane — even after quickly switching lanes — is virtually effortless. But your motorhome is not built with this easy-driving, safety-enhancing feature. That’s why you need TruCenter Steering Control from Blue Ox. Convenient push-button activation. Few driving experiences are as unnerving as trying to stay in your lane when there’s a buffeting crosswind or uneven pavement. 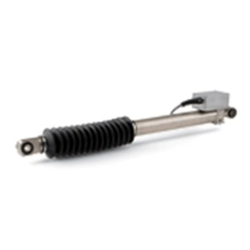 TruCenter works like a horizontally-mounted shock absorber, applying the force needed to keep your motorhome on course. Easy to adjust. When you need to create a new center position, such as if the winds change, simply push and hold the button, get situated in the lane, and let go of the button. The system works with your steering to get you back on track! Stay in control in the event of a blowout. A front-tire blowout can cause your rig to veer uncontrollably into harm’s way. TruCenter exerts up to 270 pounds of pressure on your steering, keeping the coach on course so you can stop safely. Blue Ox — a name you can trust. Not only is easy to install and completely transferable, but it is manufactured to the highest industry standards and rigorously tested in real-life situations. TruCenter is backed with a two year warranty and the ability to add up to one extra year. So you can depend on TruCenter to perform in the most stringent driving conditions for years to come.